SITKA, AK — It’s early morning in southeast Alaska. Stars have yet to fade from the night sky. A group of scientists sets out in search of a different kind of star. Sea stars, commonly known as starfish, have been vanishing from North America’s Pacific shoreline. 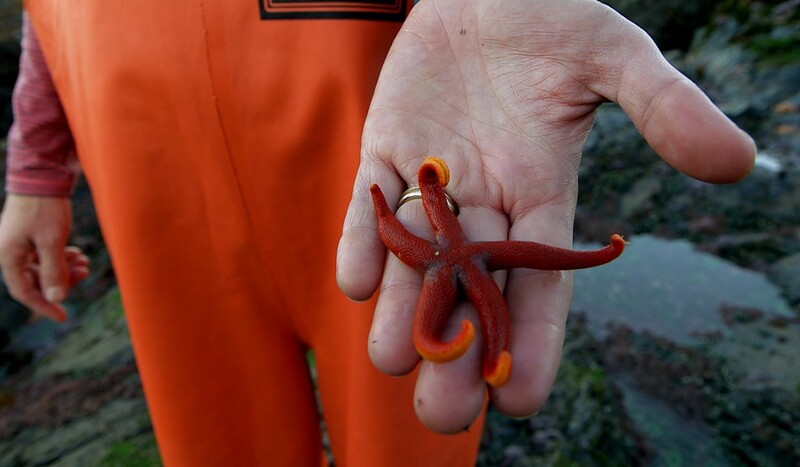 “Almost everywhere we’ve looked in the last year, we’ve seen catastrophic losses of sea stars,” says Pete Raimondi, a biology professor at the University of California, Santa Cruz, who has been studying an alarming epidemic that’s been killing starfish by the millions. Raimondi’s team has been tracking the spread of the disease. They noticed signs of the disease in Sitka in the summer of 2013, but there hasn’t been a mass die-off until now. Scientists believe that warming water or an infectious pathogen, like a bacteria or virus, may be to blame, but no one knows for certain. Raimondi works alongside Melissa Miner, a University of California, Santa Cruz, researcher. As waves crash onto the shores of Kayak Island near Sitka, they rope off a patch of shoreline and set to work counting and measuring the creatures that live here. 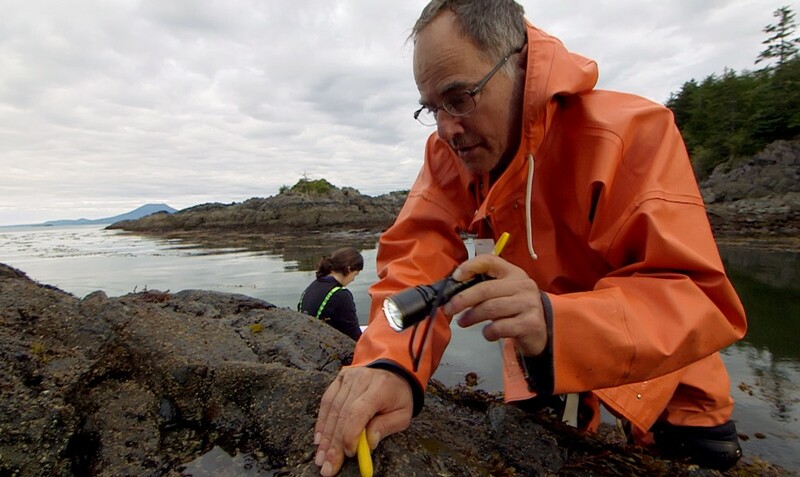 Raimondi and Miner’s survey is part of an effort to track the overall health of the Pacific coast’s rocky intertidal habitat. They’ve been conducting surveys at about 150 West Coast sites, many of them for more than 30 years. Their data has provided a critical point of comparison for what normal starfish populations have been in the past. Without similar surveys on the East Coast, it’s been difficult to measure the extent of the wasting there. Crouching on the rocks, Raimondi aims his flashlight into the cracks and crevices. He’s hunting for a tiny six-armed star called a leptasterias. “These cracks, in previous years, would be full of guys. They’re really empty this year,” Raimondi says. Then he finds what he’s looking for — a mottled gray star that even at full-size fits in the palm of his hand. It has whitish lines down it’s arms — one of the early signs of wasting. The symptoms vary depending on the species of starfish, but Raimondi says it usually starts with lesions. 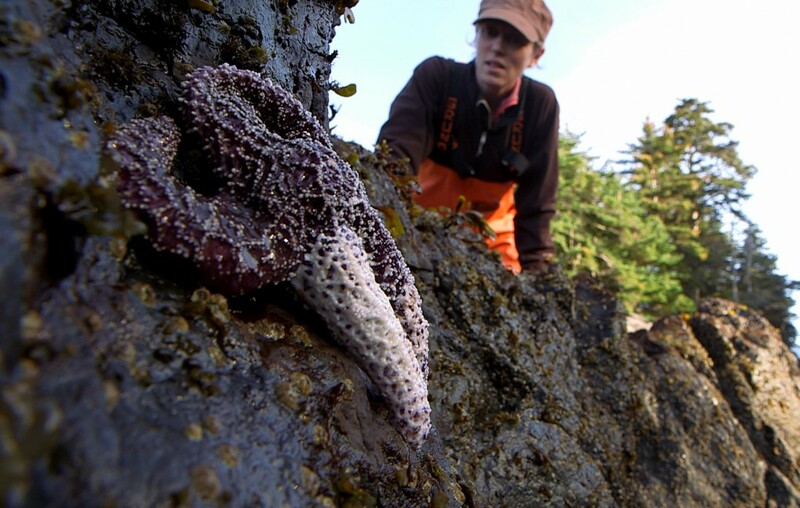 Not far away, Miner finds a pisaster ochraceous, or ochre star, that looks even sicker. Two of its five purple arms look ghostly white, like they’ve been dipped in candle wax. 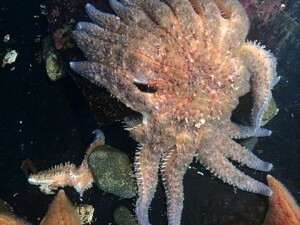 Nearby at the Sitka Sound Science Center, aquarium manager Taylor White recently discovered that starfish in their touch tanks were losing limbs. The aquarium has an open-water system so what’s happening in the tanks is a good indicator of what’s happening in the surrounding marine waters. White is concerned that the outbreak will wipe out many of Sitka’s starfish. “We’ve been telling people to take their children out to low tide to see the starfish before they’re not there anymore,” White says. Sea star wasting syndrome now affects almost every species of West Coast starfish. The plague has hit so hard over the past year that biologists fear some species could go extinct. After analyzing countless samples in the lab, some researchers believe that a virus or bacteria may be the root of the problem. But the pattern of the spread of the syndrome has been perplexing. 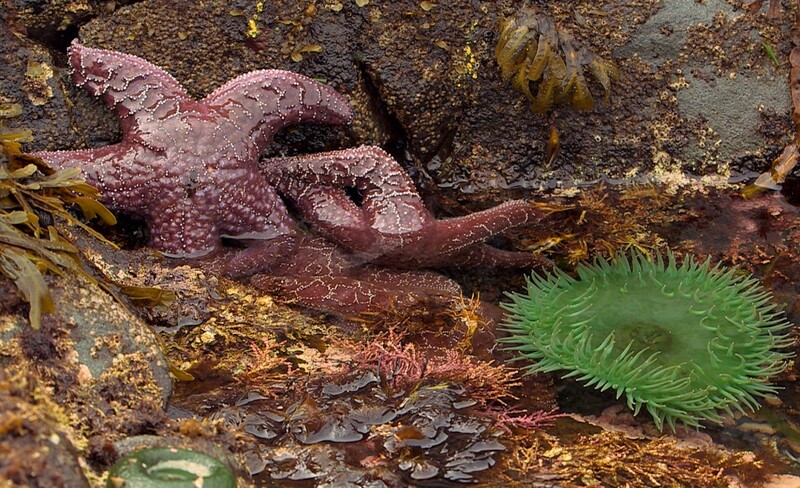 Diseased starfish were first noticed on Washington’s outer coast in June 2013. Over the winter, the disease killed off stars in droves near Vancouver, B.C. and some parts of Puget Sound. Then the syndrome seemed to skip down to California and later returned north to wipe out stars along the Oregon coast and the San Juan Islands. Marine epidemiologist Drew Harvell has been studying the syndrome from the University of Washington’s Friday Harbor Labs on San Juan Island. She’s been coordinating nationwide research on the outbreaks and says the team has evidence that a pathogen is behind the die-offs. Harvell says the team is testing the hypothesis that warm water could play a role in triggering the outbreaks. Starfish are stressed by higher temperatures, which make them more vulnerable to infection. Harvell’s team has been keeping an eye on the once abundant starfish populations in the San Juans. Cold water here may have helped them withstand the first wave of the disease. But summertime brought warmer waters to the islands and the stars suddenly got sick and the numbers of starfish at their research sites plummeted. In recent months temperatures throughout the Pacific have been unusually warm. In August, global sea surface temperatures reached record levels — the average temperature was 1.17 degrees Fahrenheit higher than the 20th century average. As die-offs continue in Puget Sound and along the coast of Oregon, scientists have been looking north for a sign of hope. “The hope is that the waters are cold enough in Alaska, the northern part of their range for many of these species, that they’ll persist there,” Harvell says. Scientists hope that Sitka will mark the northern edge of the wasting syndrome. As long as there are still pockets of healthy stars, Raimondi says recovery is possible. That’s because starfish larvae can float in the water for up to 45 days, and ocean currents can carry the babies hundreds of miles from where they were born. 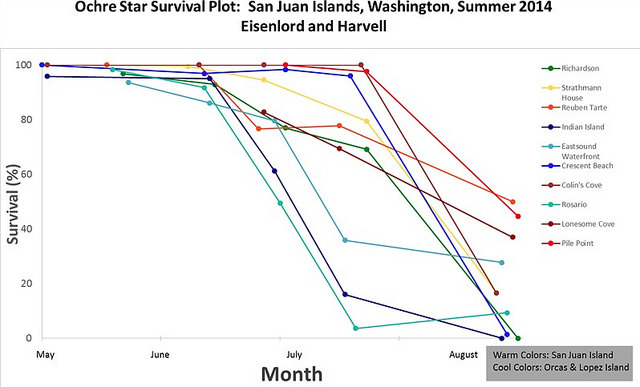 Starfish farther north in Juneau seem to be holding strong, Raimondi says. If that continues, parts of Alaska could still serve as a refuge from the disease. Editor’s note: This post was originally published on Oct. 14, 2014. A version of this video report will be broadcast on the Oct. 26 episode of PBS NewsHour Weekend.